Is Three Days A Streak? I signed up at Planet Fitness on Friday and so far I’ve made it to the gym four times. Once each Friday and Saturday and I went twice today, once before and once after dinner. My goal is a minimum of 30 minutes of cardio every day no matter what. I’m also going to try to do something new each time I go in. Today that something new was the stair climber machine. I did a total of ten floors and I thought my heart might explode. I don’t know how Keep It Up David does it! They have a 12 minute ab circuit I could do as well as a 30 minute cardio circuit is like to try as well. And I really want to get back to strength training again too. Tomorrow I’ll be back there again after Mattie gets home from work hopefully for a 45 minute workout. Today was a bit of a struggle to stay on track with food but I feel like I did okay. I made good choices throughout the day and went to the gym to do a half hour of cardio before dinner. Dinner was a big salad with ham on it, and a side of mac n cheese that Mattie grumbled about because it was spicy. I used nacho cheese that I had leftover from last night on the pasta and that was very evil of me. After dinner we went to Palmdale to check out a new frozen yogurt place (Yogurt Land) and we were impressed. I got the Vanilla Malted and Chocolate Truffle swirled together with a few cookie dough bits mixed in. I only filled my cup about halfway so I wouldn’t do too much damage to my day’s eating. After we had our froyo, we popped by Bevmo to pick up some fancy specialty beers, Mattie some wines, and me a bottle of Sailor Jerry’s. I love me some good rum and Sailor Jerry’s is my favorite! I also made a trip earlier in the evening to the store where I bought lunches to last Mattie out the rest of the month, apples, bananas, a cantaloupe, more lettuce, some bacon, and some pudding cups. That leaves me with about $5 til the end of the month after I take out for dog food, which if I’m lucky the dogs won’t even need this month because I bought two bags at the end of last month. I also did some quick crafts, busting out my polymer clay and making a pendent, and some clip on style earrings which I’m not quite finished with. I’ll finish them later this evening. Its Friday night and Mattie stopped by the store to pick up dinner that he decided to cook me. He did some nice steaks in the broiler, baked potatoes, and broccoli. We had butter but nothing else to put on the potatoes, (and I’m the type to slather my baked potato in either sour cream or Greek yogurt) so I did a little butter and nacho cheese since we didn’t really have anything else to put in the tater. I put the cheese on the broccoli too. Dinner was really good, and I managed to stay under my calorie goal for the day as well. I started tracking with Spark People this week. I previously used My Fitness Pal on my phone but the last few weeks the ads got so bad that the app was unusable. 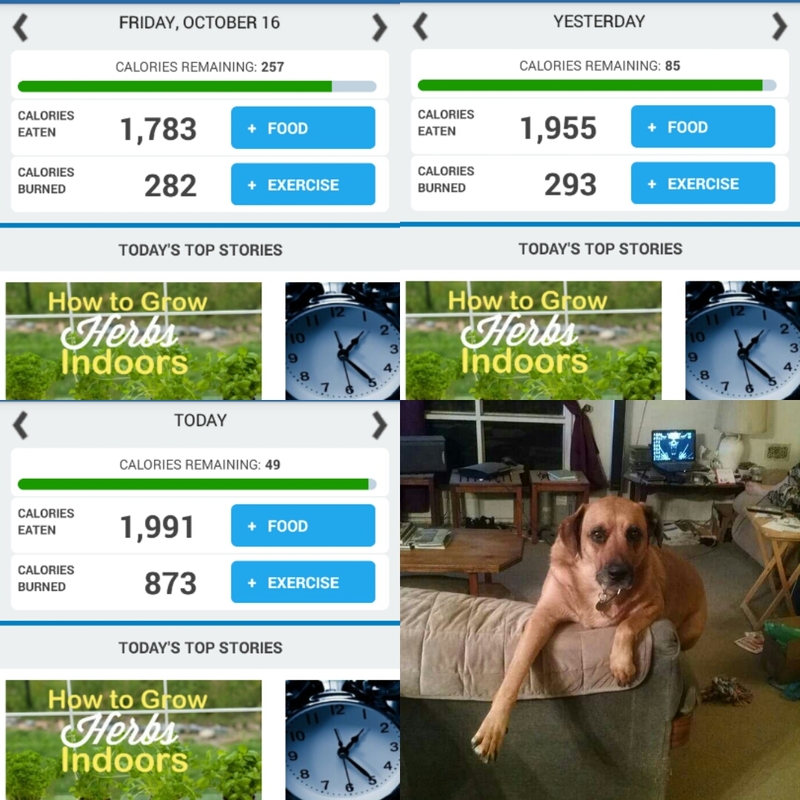 So far I’ve managed to stay under my calorie goals all week but the scale hasn’t budged. Still, it hasn’t gone up so that’s good too. I think the scale isn’t moving because I’m not moving enough, but I’m working on that too. Today the only mail we got was a flyer advertising a new Planet Fitness that opened only 2 miles away and that membership was only $10 a month. I remembered hearing a friend of Twitter a few weeks ago saying he had just signed up there so I figured why not drive over and check it out. The people there were friendly and helpful and they gave a good tour of the place which was nice and clean and appeared to have really nice equipment throughout. The cost for the basic membership which is all I need is $10 a month, a $1 sign up fee, and the yearly fee of $29.99 which comes up in February. I signed up, went back home for a bit, and later went back for my first workout. I walked a half mile on the treadmill, then did 18 minutes on a recumbent bike for a total of 29 minutes of cardio, then went home. It was a baby workout but its been months since I’ve done anything and I was feeling it. I’ll go back again tomorrow. Not a lot else to say today (and I did do double today with my shopping post) so going to call it good here. See you next time!